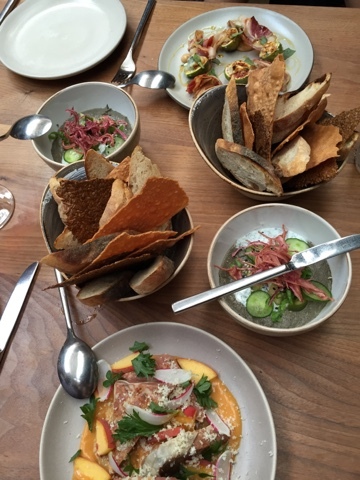 This past weekend, some friends and I went to Central Kitchen in the Mission. It is a beautiful indoor/outdoor place with lots of plants, wood furniture and hanging string lights. It had a very earthy feel. They have a Chef's Choice option that we all chose. For $75 you get 5 courses created with seasonal ingredients and every course is a surprise. The first was a "snacking" course with a pepper/tahini dip, lots of flatbreads and thin crackery crips, peach and pate and this fig/prosciutto salad. It was absolutely delicious. 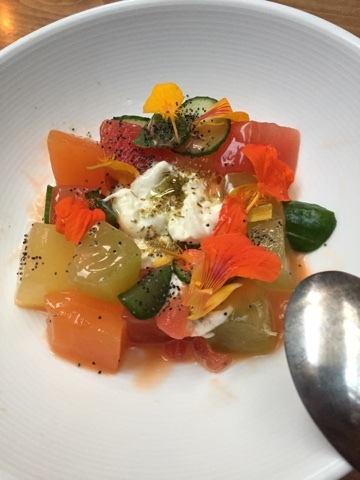 Our second course was fennel and yellow fin tuna followed by a melon and burrata salad. All the flavors were so fresh and distinct, it was beautiful how they worked together on your palate. 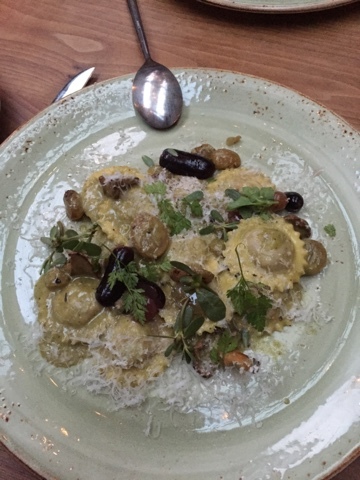 Our third course was a pork ravioli with roasted grapes and parmesan. Very yummy and rich. By the fourth course it was too dark for pictures, but we had a duck confit stuffing and a roasted hen. It was incredibly tender and yummy. Dessert was a small mason jar filled with a chocolate salted caramel pudding. It had candied almonds and an oreo cookie-like crumble on top paired with a scoop of coffee ice cream. Heaven, obviously. While it was more than I usually spend on dinner, it was a fabulous treat and I definitely recommend it you are visiting SF. My only critique was that the music was incredibly loud. It is a small restaurant and an intimate setting, that would be perfect for conversation and more of a mood music background. Maybe, I'm just a Grandma, but everyone at our table had trouble hearing each other and when we asked them to turn it down, our waitress told us that "We keep it at a certain level."